Excited to announce that I have been invited to participate in a holiday market this December at Bernard Katz glass studio in Bridgeport, PA. I will be showcasing my new paintings, prints and art jewelry along side Bernard Katz beautiful contemporary glass art. Plenty of wonderful one of a kind, handmade items (big & small) for your holiday shopping. Come out and meet the artists, learn about their art process and enjoy some light refreshments. Watercolor, acrylic paint, and graphite on paper, set on wood. A community of local artists invited to create art that is based on a specific artwork in the Barnes collection located in Philadelphia, PA. Excited for the opportunity to exhibit at the Barnes and the chance to win a residency with the help of votes from the public. Anyone who wants to participate to be a voter will be able to visit the museum for FREE! To register follow this link LetsConnect once registered you can vote in person and attend the museum for free until June 4th. My inspiration was Cézanne’s painting Girl with birdcage. *If you have any questions about the art or event feel free to send me a message. Thank you! The reason behind my theme choice, I wanted the challenge of telling a story through my art..
Materials: Recycled cardboard, chipboard, cut paper, graphite, charcoal and one color. I am everywhere and nowhere..
Creatively speaking I hit a rough patch recently, I arrived at the point without a desire to create and my attempts to paint went awry. Refraining from beating myself up over this dry spell (ok I admit to a small temper tantrum), I decided to make an effort to do other things. A brisk walk around the neighborhood is one of my favorite things to do to clear my head. On occasions I would take time to observe, photographing interesting things along the way. One of the images I photographed was an old house in the neighborhood which I have passed many times. I always admired the structure and unique ornate features of the house. This image was the spark to start me off on my little painting adventure. Always fascinated with the stories behind the facade but alas the only information I could find on this old house was the date it was built, 1896. 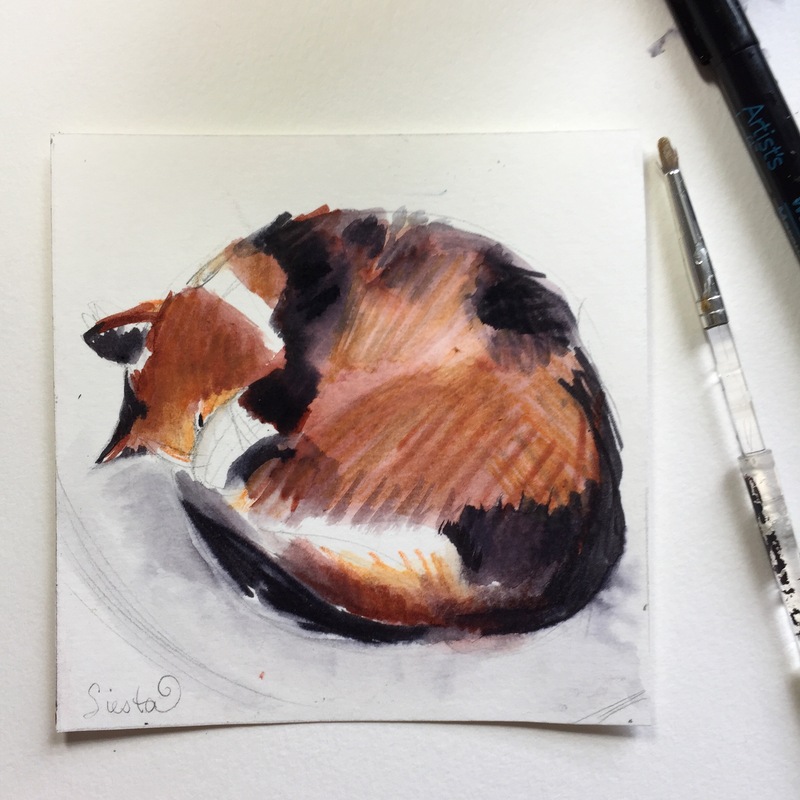 I’ve been using a sta-wet palette, it helps keep my paints from drying out. Thanks for stopping by and letting me take you on my little creative journey. This week was the start of the 100 day project on Instagram . The challenge is the process of creating something everyday for 100 days, any style, shape, medium of your own choosing.. If you are interested in joining the challenge visit Elle Luna for all the details. Many moons ago I attempted a challenge, creating mixed media art everyday for 100 days but unfortunately I fell short. 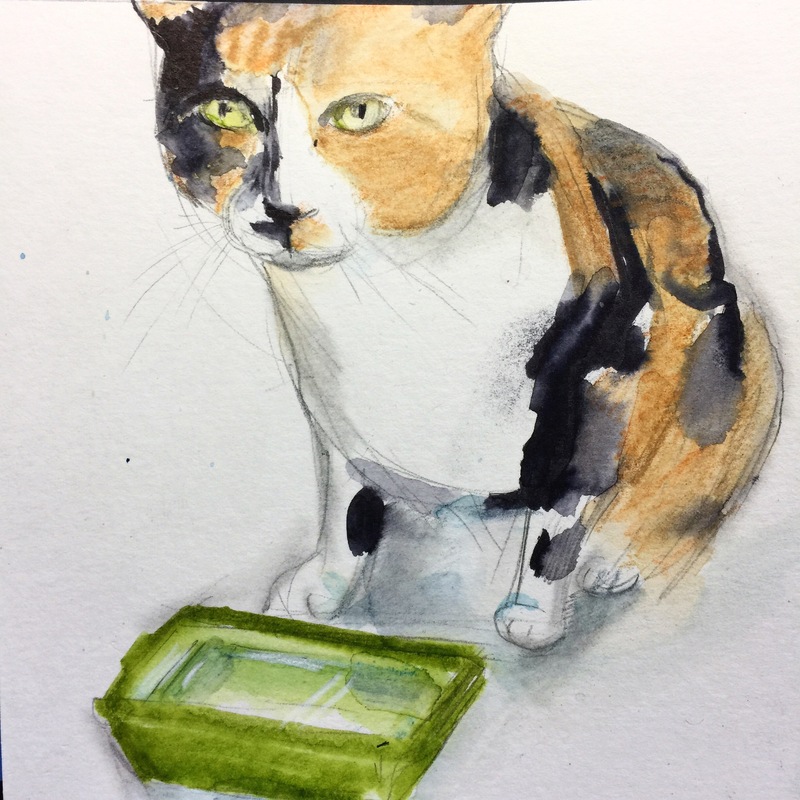 This year my goal is to accomplish 100 artworks of my cat Cookie #100DaysOfCookieCat . 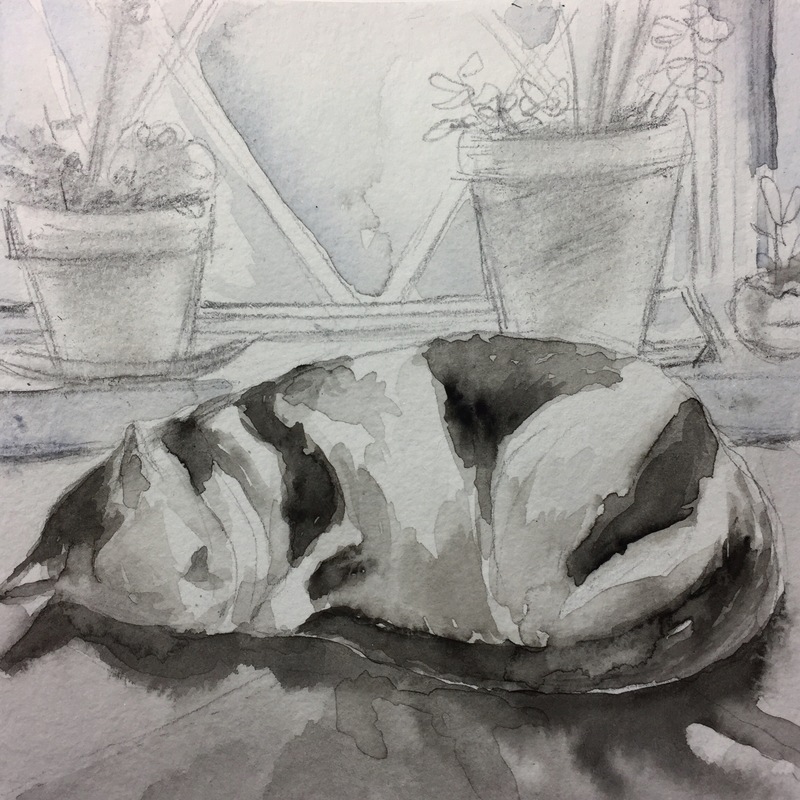 I will be working on 5×5″ watercolor cold press paper utilizing any medium. A little backstory.. We adopted Cookie 2 yrs ago from Spay and Save, Inc. The moment my daughter met Cookie, she knew the cat would be perfect for our family. My daughter was correct, Cookie is a wonderful cat, quirky, boisterous, loving, sweet natured, and a great cuddle buddy.. When anyone is visibly sad or cries Cookie will appear to comfort that person and sometimes she will run over to the person to give a kiss on the cheek.. true story! Oh hello darling, I miss you..
Have you missed me..WordPress? … huh? Oh your silence is cruel..
My choice of play has been Instagram, and Facebook but I did miss writing… My goal this year is to get back to writing and posting regularly.. I really did miss reading my favorite bloggers posts, such a great community of talented inspirational people on WordPress. A year ago at this time I participated in my first art drop, randomly placing small works of my art around the city to be found. I had so much fun with the art drop last time, I decided to do another one. On my birthday, carrying 4 small paintings, I scampered around the city of Philadelphia, leaving my art behind.. This day I felt like a tourist in my own city. If you ever plan to visit Philadelphia, Pennsylvania, here is some fun information about things to do in the city. The power to truly listen to that which wants to come through you can be a tough thing to accomplish. Life happens, distractions occur but finding a quiet spot to sit and let your mind wander works wonders…. When words find you in that space where your mind fades, magic happens. Sometimes we just need to get out of our own way. 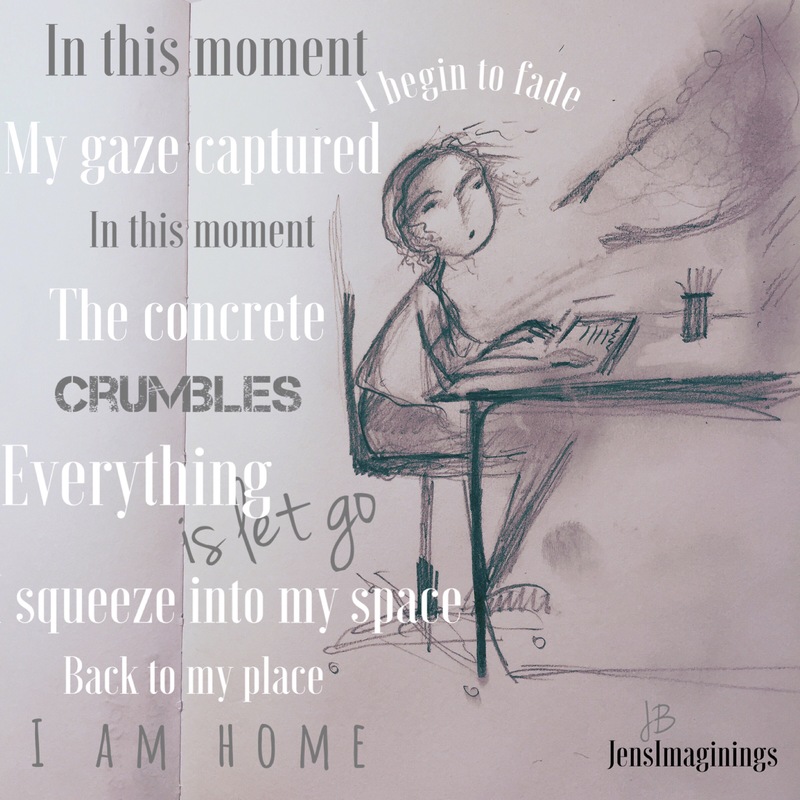 Writing my morning pages brought forth this intuitive sketch.. Thank you for stopping by to view my work and videos..
Every so often I like to change things up and create abstract art. I like the freedom and exploration of the process. 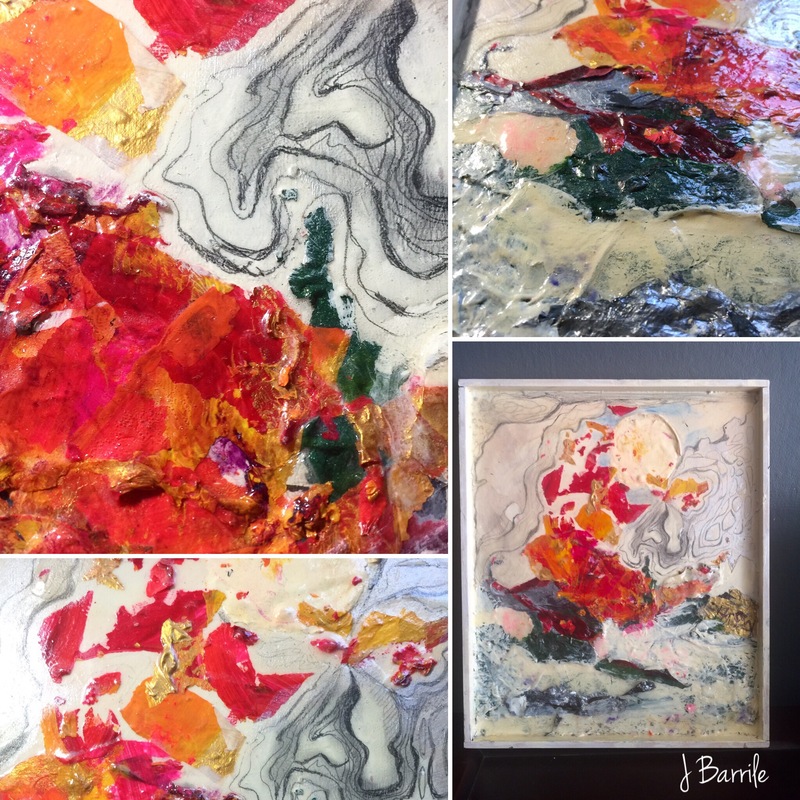 The past few weeks I have been working on two mixed media paintings simultaneously. Working on these paintings felt like a tug of war, a love hate relationship, a labor of love with lots of juicy layers. 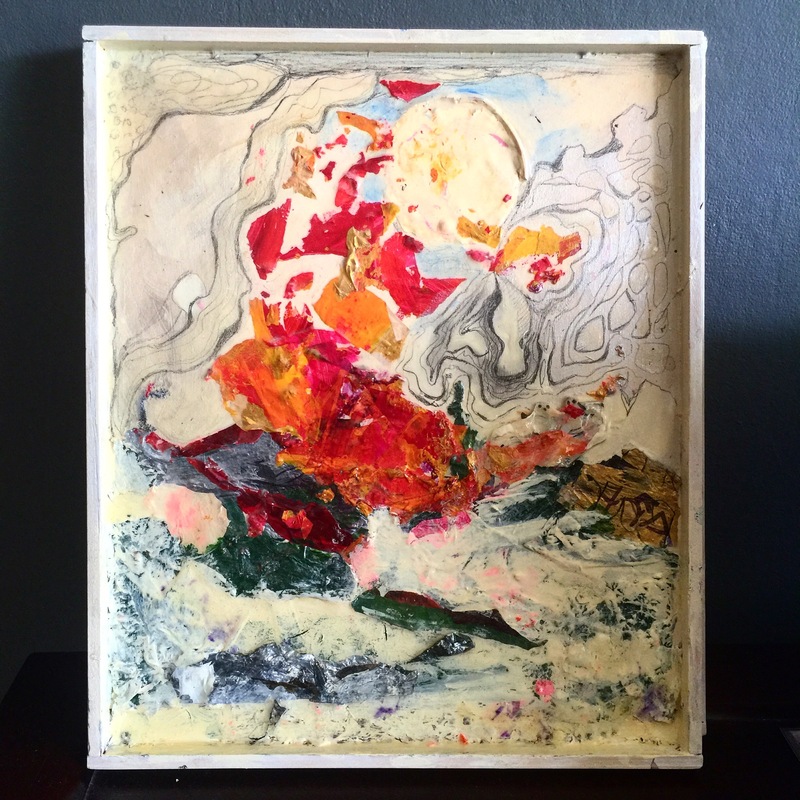 Life in abstract: Acrylic paint, graphite, varnish on handmade wood frame. So it happens, that feeling, that mood which hijacks your body and clips your wings. Don’t dare fight it, just brush it off, keep moving and you will fly again.